A software issue has caused check-in delays at several airports worldwide, and booking problems for many airlines. Passengers reported problems at Gatwick, Paris Charles de Gaulle and Melbourne airports among others. Gatwick blamed a passenger management system called Amadeus Altea but said the problem had been resolved and there were no further delays. Amadeus said it experienced a "network issue" in the morning but that services were quickly restored. Several airlines use the Amadeus software to manage reservations and check-in desks. British Airways, Qantas, Southwest and Lufthansa are among its customers. 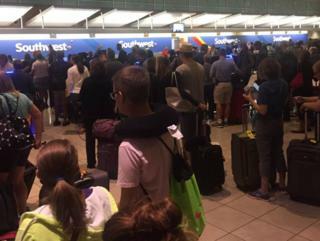 Reports of delays at several airports appeared on social media at about 10:00 BST. During the disruption, Heathrow airport said: "A small number of airlines are experiencing problems across the world and we're working closely with them to solve the issue." Gatwick airport said the technical issue had been "brief" and that no flights had been affected. A spokesman for Amadeus made a statement at 11:45 BST, confirming that "a network issue caused disruption to some of our systems". It said the issues had been resolved by 14:30 BST. "Our systems are recovered and are now functioning normally," the company said in a statement. "Amadeus technical teams took immediate action to identify the cause of the issue and mitigate against the impact on customers. Amadeus regrets any inconvenience caused to customers."